Transport bosses were warned a tram had "tipped on one side" a week before another tram derailed at the same corner killing seven, it has emerged. Shantall Singh complained to Tramlink saying she thought she would die when a driver "sped" around the bend near Sandilands station on 31 October. On 2 November, the company replied saying it would "fully investigate". Tram operators Firstgroup said it was "not appropriate to comment" as investigations continue into the crash. 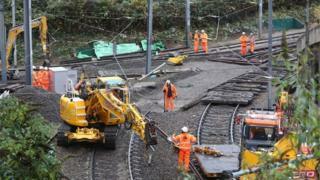 One woman and six men were killed, and more than 50 people were injured, when the tram derailed in Croydon on Wednesday. Ms Singh told BBC London some of the tram's passengers were flung to the side of the carriage as it went around the corner. "There was a guy on my left hand side and that guy ended up on me and pinned me to the corner of the tram," she said. "As the tram went around the bend at the junction between Lloyds Park and Sandilands the driver from my point of view missed the bend or he was going too fast. I thought I was going to die and leave my two-year-old son. I do hope this matter will be looked into because I am left with a fear for travelling in the tram." "We are sorry to hear of this unfortunate incident and we would like to reassure you that we will be fully investigating this. There are a couple of trams it could be and to identify the driver and to view the CCTV from the tram we need to have these details as soon as possible." She emailed Tramlink customer services to say she hoped they would investigate as "I am left with a fear for travelling in the tram". In Tramlink's response, the company said it was "sorry to hear of this unfortunate incident" and would check CCTV to find out what happened. Another person who was on the same tram wrote on Facebook that it had "lifted onto one side at 40mph" as it went round the corner. When asked by BBC London about the emails, Firstgroup said it was "working with... authorities to provide assistance to the ongoing investigations". "Clearly, previously reported incidents will form part of those investigations," the company said in a statement. It is understood the same driver was not involved in both incidents. Dane Chinnery, 19, Philip Logan, 52, Dorota Rynkiewicz, 35, and Robert Huxley, 63, who all lived in New Addington and Donald Collett, 62, Phil Seary, 57, Mark Smith, 35, from Croydon died in the crash. Investigators have said the Wimbledon-bound tram was travelling at a "significantly higher speed than is permitted" as it entered a tight bend before flipping on to its side and sliding. The driver of the tram is on bail after being arrested on suspicion of manslaughter.